I feel like I’ve tried it all but I continue to find new amazing things to keep my body and mind healthy. I love sharing what works great for me – so here we go! But first… Lets get real for a moment..
Theres no denying that exercise is one of the most vital things in life. If you’re not healthy your body will not be able to do the other things that you need to do. Eating healthy and working out should go hand in hand. It does take stepping out of your comfort zone and sometimes forcing yourself to do the things you KNOW you should but don’t want to do. Humans are wired to do the things that come natural. Wer’e drawn to choose the easier things in life rather than make the tougher choice. Just remember that those small choices you make daily are what make the most difference. Today I would love to share with you some fun stuff that keeps me motivated and on the right track. Drinking water is vital for your body to preform at its peak ability. Drinking water can be extremely boring for some. I get it, really, its just water and not very exciting. This is one of those things that you must force yourself to do because you know its impact on your health. You should be drinking half your weight in ounces of water daily!Something that helps me stay motivated daily to drink water is as simple as finding a fun water bottle. When its one that I know I like I’m much more likely to pick it up often in my day. 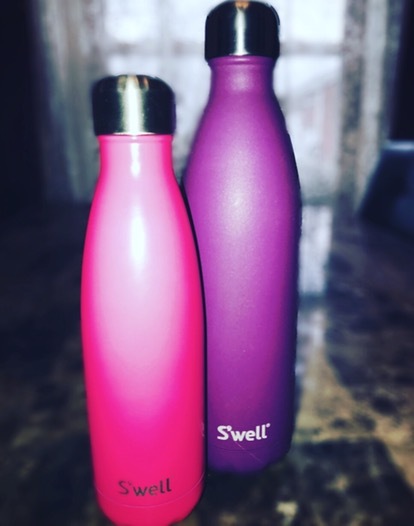 A bottle that rises above the rest in both performance and, (in my little ol’ opinion,) is the” http://www.swellbottle.com “. Its by far the best water bottle Ive ever owned. I can pour ice cold water into the bottle in the morning and by the NEXT morning it’s still cold. No joke. The company claims that cold liquid stays cold for 24 hours and hot stays hot for 12 hours. I’ve not tested out hot drinks so I cannot give my thoughts there. Im 100% in love with these bottles. The hype is definitely legit! The price is above the average which means you have to be ready to invest in quality when looking to purchase a S’well bottle.Here’s the facts, it doesn’t matter if you pay $45 for a bottle or $5, if you love it and it helps motivate you to drink more in your day-> USE IT! Thats what all this is about. Finding the right things to keep pushing you toward you goals! We’ve all been there when were in the middle of a workout and our yoga mat is getting more in the way than actually helping us. It’s a sad story but you really get what you pay for in a good quality yoga mat. I’ve tried different brand and have one that I’ve fell in love with. https://www.manduka.com/yoga-mats/prolite.html . The Manduke mat is a yoga mat that brings unmatched cushioning and comfort to your practice. The PROlite® will never wear out, guaranteed. Literally its guarantee is for a lifetime. Thats how confident they are in their quality.I will definitely say they get better with age. After a couple years you start to notice they “break in” which just means it becomes more conforming. It’s unreal the high quality these mats provide. Yes, just like the S’well bottles, these are not in the cheapest realm of price points. A yoga mat is definitely something that is in that category of “You get what you pay for”. Invest in a $82 higher priced mat and it WILL last a lifetime vs -> spend $19.99 on a mat that will last MAYBE 3 months of mediocre quality and then needs replaced. The higher quality pays off very quickly!My Manduka mat still feels like brand new after a couple years of DAILY use. That tells me something! Again, it’s always your choice how you want to invest. If you’re looking for a more reasonable price point stop by your local sporting goods store and talk to a sale rep. They are out there and can work for you. You can’t go wrong with any mat you chose. Especially when your using it at Vivid ;). I love feedback and will love to hear for you about what you would like me to talk about next. Leave a kind comment below and I’ll keep these blogs coming! Group fitness classes provided by certified fitness professionals right in Brookville, Ohio! Hours of operations during classes.